Parc y Scarlets Sports StadiumParc y Scarlets officially opened on 31st January 2009. With 15 executive boxes accommodating up to 12 guests, 4 lounges accommodating up to 300 guests and an indoor arena which can accommodate up to 2,000 guests, Parc y Scarlets is the most versatile venue in West Wales. Parc y Scarlets is the perfect venue for conference and events in West Wales. Situated only 12 minutes from Junction 48 on the M4 and with free parking on site, Parc y Scarlets is easily accessible for all. 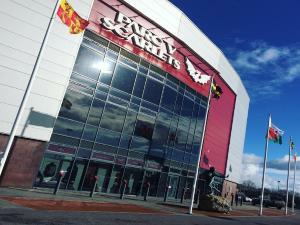 The home of the iconic Scarlets rugby club, Parc y Scarlets is steeped in the rich 140 year history of the club and is the hub of Heart and Soul Rugby Country. Throughout the year we hold hundreds of events which include, International darts tournaments, exhibitions, conferences, workshops and meetings. Parc y Scarlets officially opened on 31st January 2009. With 15 executive boxes accommodating up to 12 guests, 4 lounges accommodating up to 300 guests and an indoor arena which can accommodate up to 2,000 guests, Parc y Scarlets is the most versatile venue in West Wales. If you are searching for a personal service and a breathtaking venue, steeped in a rich history and sparkling with a unique spirit, look no further than Parc y Scarlets.